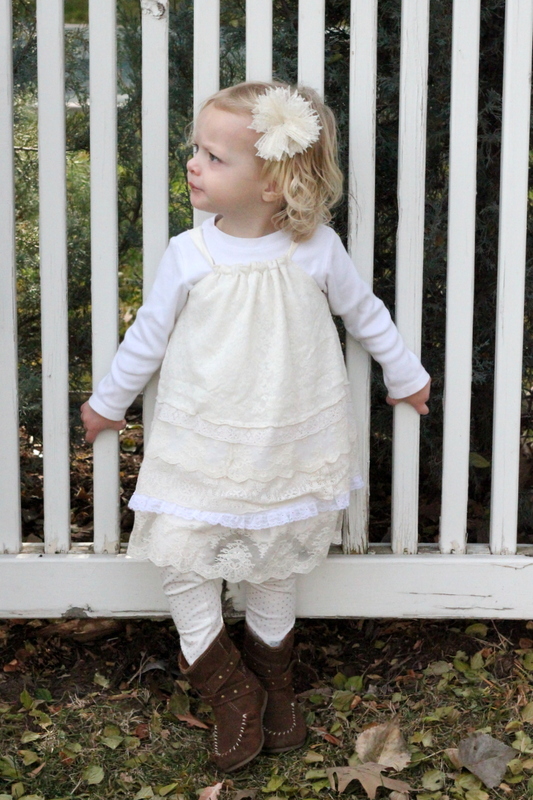 The dress Coco wears is layers of lace with a bow on one shoulder, pillowcase dress style. 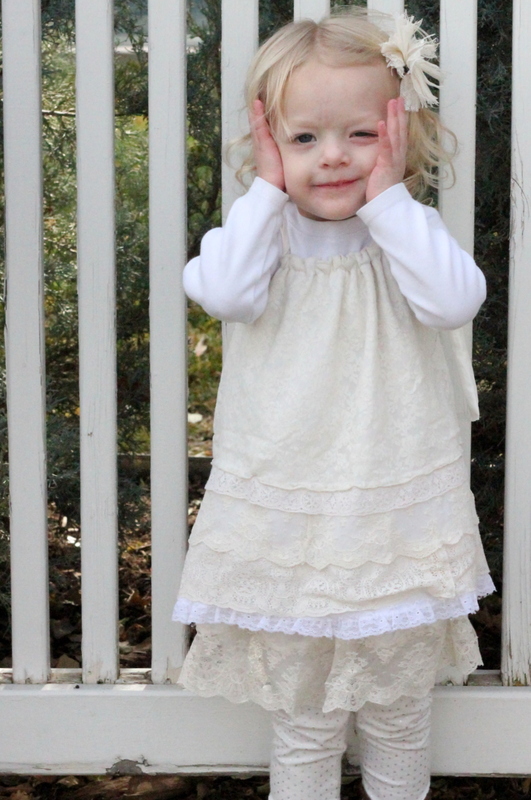 Even though a sleeveless dress is hardly December-wear, I can’t say no to that girl and her requests for mama-made dresses (plus, I figure I can just dress her in layers on Christmas Eve when she wears this dress). 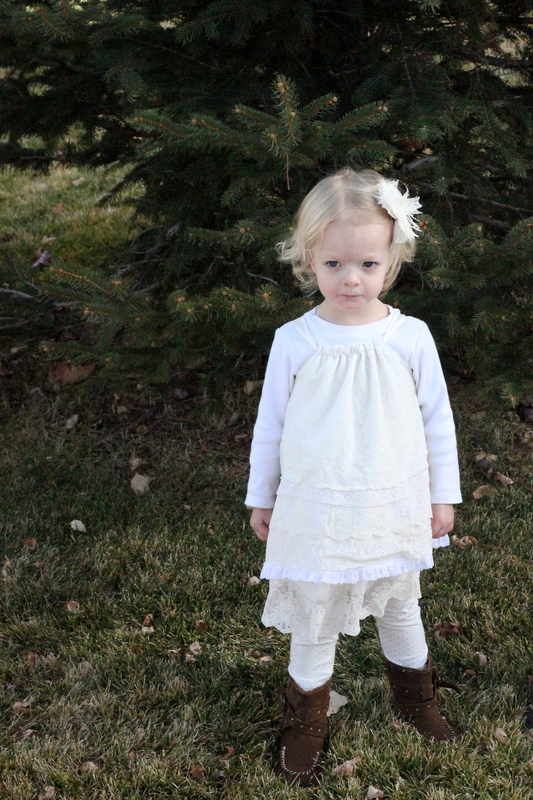 Even better, this dress is a really easy sew (confession- I made a matching doll sized one in case I get around to making her a Coco doll for Christmas). Put the template dress on top of the slip. Add a couple of inches to the top and cut off the slip. 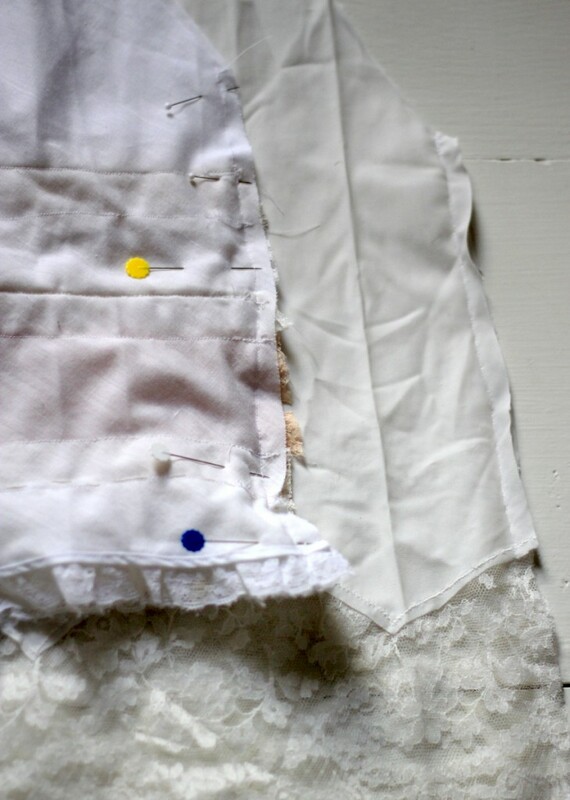 Layer the slip with plain white fabric (mine has a lace hem tape edge, but yours doesn’t have to). 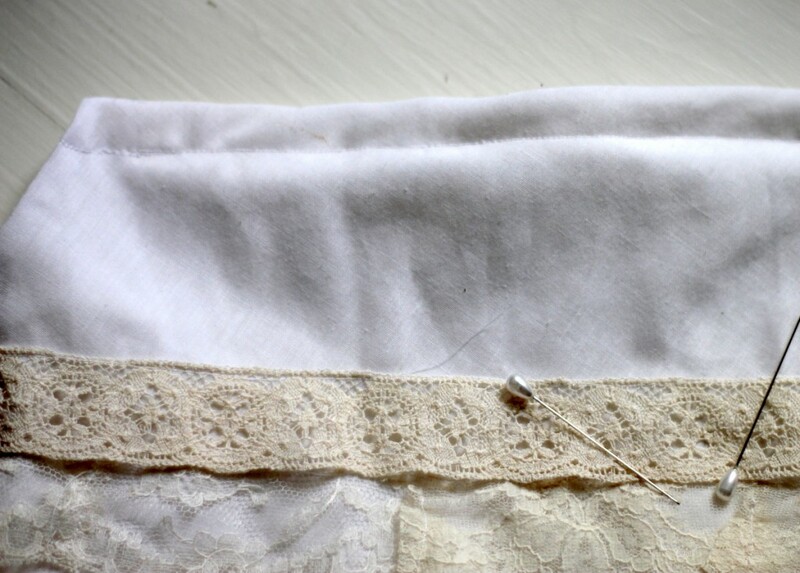 Match the bottom edge of the white fabric along the top edge of the lace and let it overlap a little. Match up the bottom edge of the slip with the bottom edge of an existing dress (to estimate length). Add an inch or so at the top edge and cut. 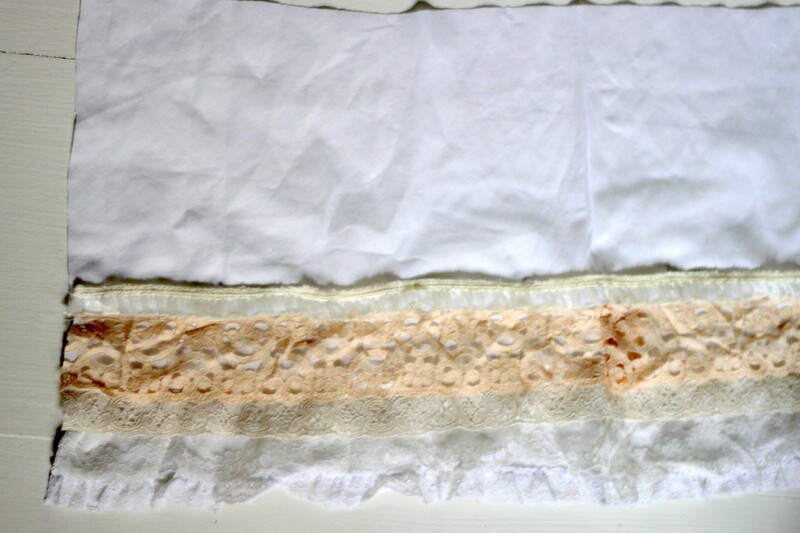 Pin and sew layers of lace to the white fabric (finish the bottom edge if it needs to be finished). 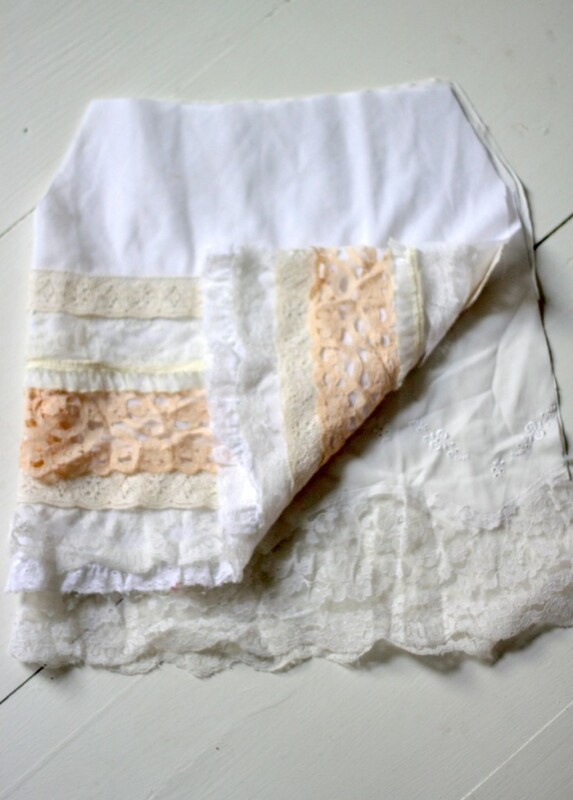 If you have a larger swatch of lace, use this as your top piece (to make the sleeves and neckline less maintenance). 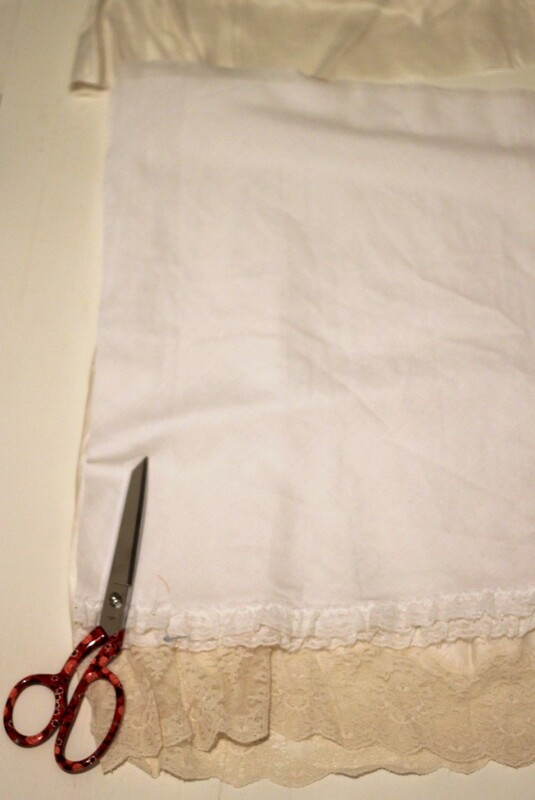 Once the fabric is covered in lace, fold in half and sew up the edge. If you need to cut down the women’s slip to match the width of the top piece of the dress, do so and sew up the edge as well (I used a women’s size small slip and still had to cut a couple of inches off to make the slip match the dress). 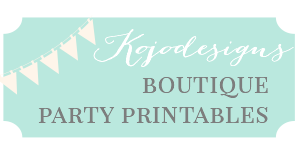 Cut triangles 2″ deep and 5″ tall at the top corners of both the dress and the slip (these will become the armholes). 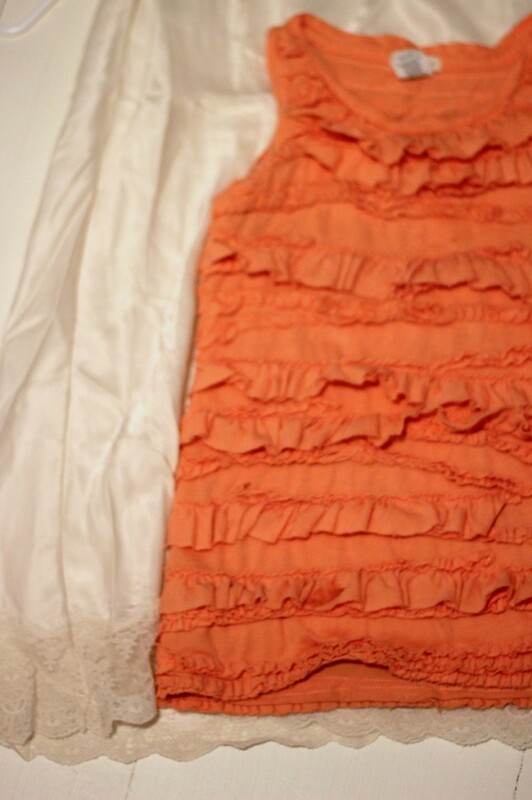 Layer the dress into the slip with the wrong side of the slip facing the right side of the dress. Check to make sure that the length is correct (the lace from the slip should show, but none of the slip itself). Pin together the two pieces along the top edges and soon-to-be sleeves. Sew the two pieces together along the entire perimeter (both top edges and the sleeves). Turn right side in. Fold the top edges (front and back) both down one inch (it’s a finished edge, so you don’t have to finish it off or double roll). Sew a casing along the top edge. 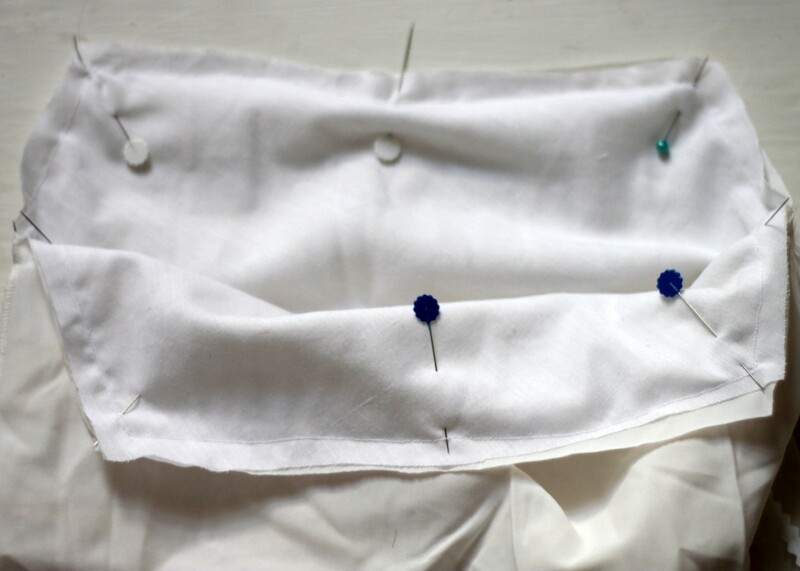 Take your looooong, thin strip of fabric and pin in half, right sides facing each other. 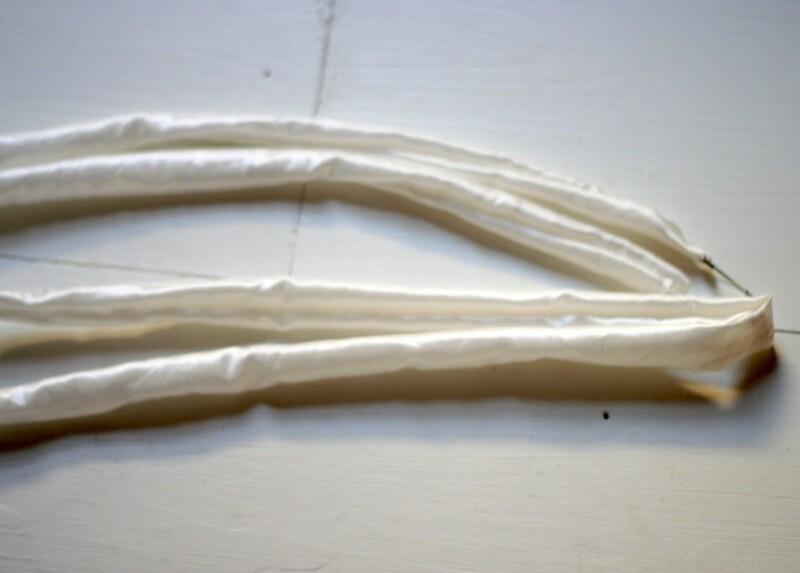 Sew up the open side of the rectangle, making a tube. Turn the tube right side in, tuck in the raw ends and finish off each end with a top stitch. 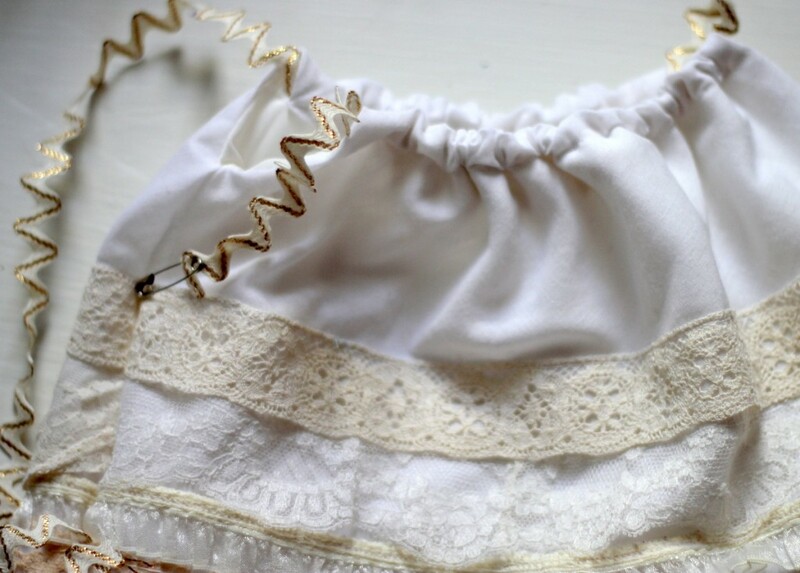 Thread the finished-off satin through the top casings (or vintage ricrac for the matching babydoll version). Measure for sleeve length and sew in place on the front and back casings (not necessary, but keeps the sleeves in place). Tie the other shoulder bow sleeve in place (again, you can sew the satin and casing together on the other edge if you want it to stay put- I did). 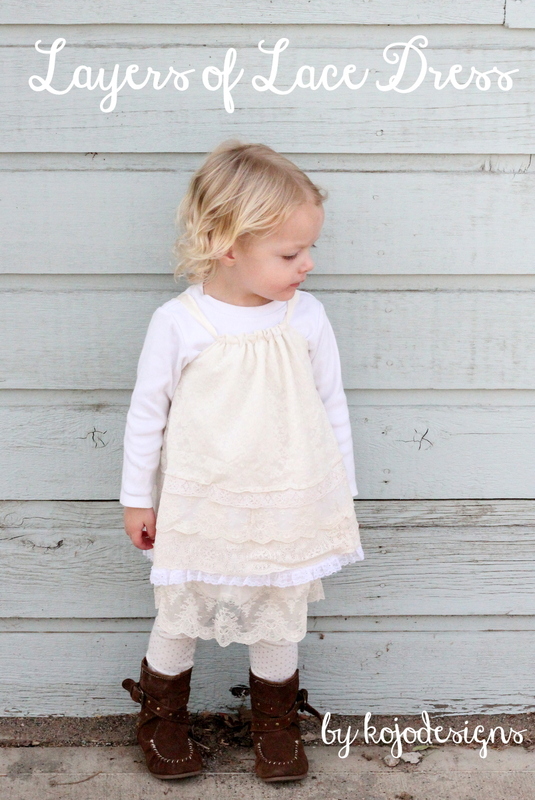 Delight a Coco-dress-admiring baby girl with her very own layered lace dress. It’s the perfect Christmas Eve dress. 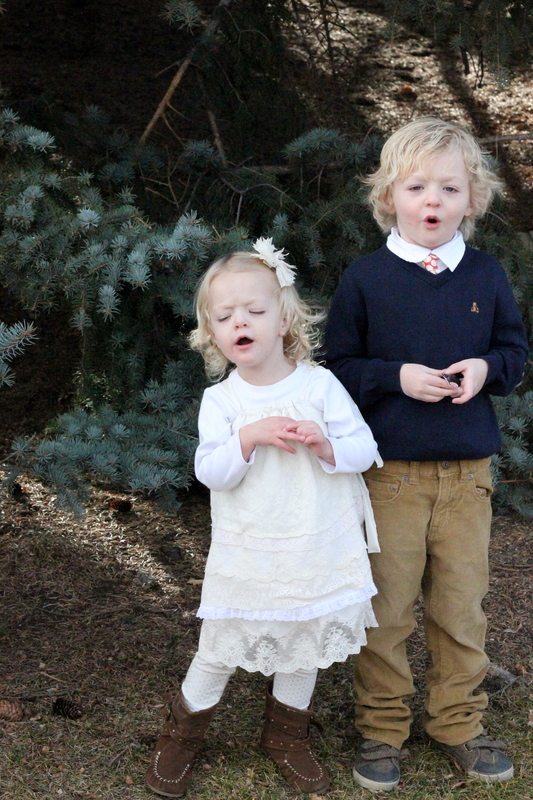 Also, some of these outtakes kill me with their cuteness (and silliness- they’re singing “O Come All Ye Faithful” in the second picture). 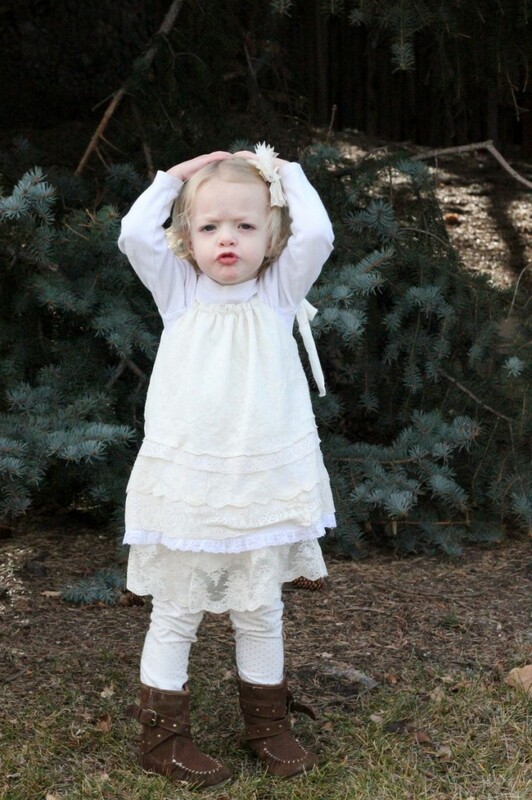 ps- When I first showed Pi the in-the-works dress, she said, “But it’s not pink- no thank you.” Luckily, she woke up from her nap with a changed heart and has deemed the white acceptable Christmas-Eve-wear. Weasel. So adorable! I love things like this!!! LOVE the dress, and as always, the children are beautiful. love it! Haha, I can’t believe she didn’t want it at first! That is too funny. I can almost hear their cute little voices singing! What cuties! You are such a good mama and that dress is adorable. I am struggling, really struggling to come up with a Christmas dress design for Natalie that I love. I think I may be thinking too hard about it. Time to get cracking! Thanks for the motivation! Can’t wait to see what you come up with for Natalie- girls are so fun! 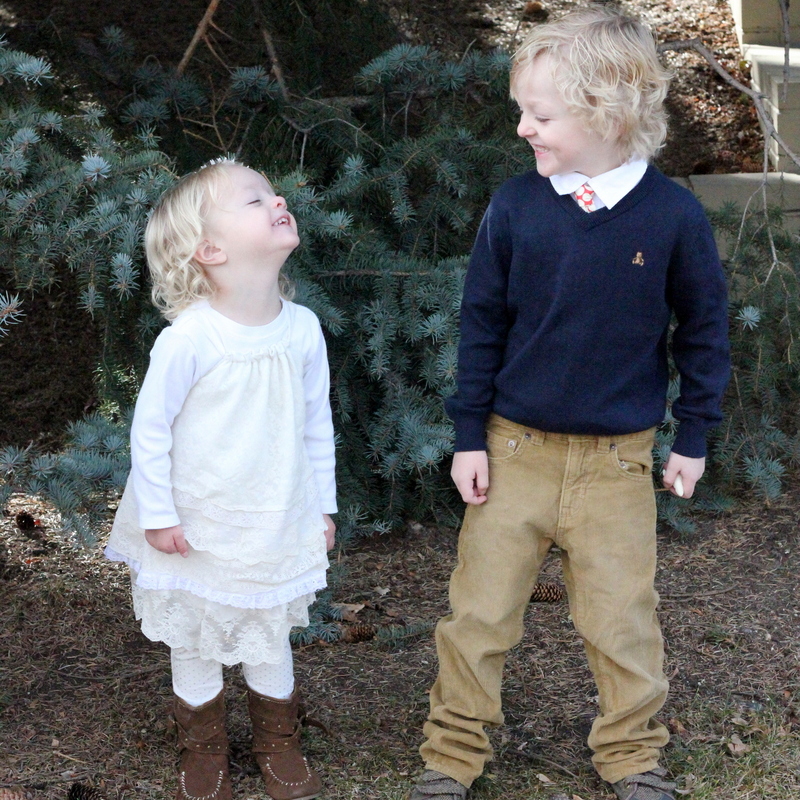 Gorgeous…and I can’t believe how much Piper has grown. Thanks Chris! Crazy how fast that happens, right??? This is adorable!! Love all of the sweet layers! Actually, the FIRST thing that I thought when I was flipping through the pictures is how reminiscent it is of that lacey maternity skirt tutorial you did, was that when you were pregnant with Piper? That was around when I first started reading your blog. So super adorable. Hmmm, glad you don’t remember. 🙂 Love your last post, btw. What a sweetheart you have!